During the winter of 2016 – 2017, Northern California experienced its wettest winter in over 100 years. As record rainfall continued into February, the Oroville Dam spillway was opened up to prevent overtopping of the Oroville Dam due to increased inflow on the Feather River. Within a short period, operators at the California Department of Water Resources (DWR) noticed an unusual flow pattern in the spillway, leading to the discovery of significant spillway damage. Outflows were quickly diverted to the emergency spillway, to allow engineers to inspect the main spillway. During this period, the emergency spillway experienced significant downhill erosion that threaded to undermine and collapse the concrete weir. This discovery, and led to the decision to evacuate communities downstream of the dam. 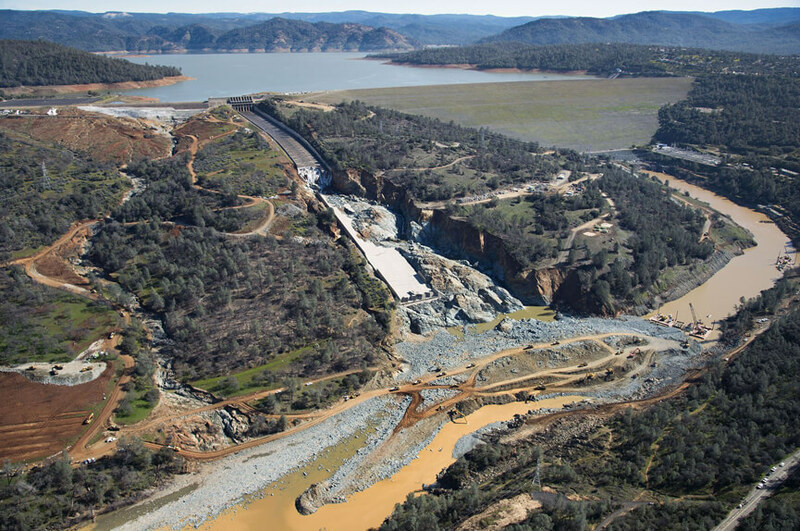 DWR retained Kiewit Construction to lead the repair efforts for the Oroville Dam Spillway. Kiewit in turn awarded a portion of the geotechnical instrumentation and monitoring work to Terracon. sensemetrics’ platform was promptly chosen as part of the spillway emergency response team because of its plug-and play support of geotechnical sensors (Geokon and RST Instruments) and ease of installation. The initial time critical task was to install piezometers, inclinometers (both in-place inclinometers and ShapeArrays) and weather station sensors immediately after the risk of additional rain and associated spillway failure diminished. The Contractor budgeted a three (3) week period allowing for automation of the installed sensors. However, sensemetrics and Terracon installed and automated all installed sensors within just three (3) days. Once installed, sensemetrics’ platform continues to provide valuable streaming of sensor data during the repair process. As a result of implementing sensemetrics’ platform during the Oroville Dam Spillway repair efforts, California DWR and emergency response partners had access to real-time sensor data (graphs, reports, maps, alerts, etc.) and was fully configured within three (3) days rather than the budgeted three (3) weeks. In addition, optimized system design resulted in hardware and installation cost savings of over $200,000. sensemetrics’ scalable monitoring platform elastically responds to daily monitoring needs while supporting future design plans and objectives. As a result, DWR has initiated a long term contract with sensemetrics covering total dam condition monitoring which provides real-time information for informed decision making.